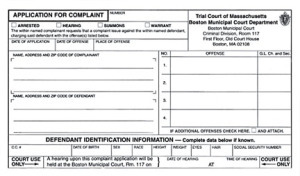 The notice for a criminal complaint application often comes as a surprise to the accused. Not always are the responsible parties charged with committing crimes. For example, several times I have represented people facing a clerk’s hearing for the crime of leaving the scene of an accident. Many times the accused person was not driving the car or even in the car. Here is how that happens. Lets say someone’s car is hit by another car. The offending car leaves the scene but not before the driver of the other car gets the license plate information. The police will identify the owner of the car and he or she will get a notice to appear for a clerk’s hearing. Yet, at the hearing if no one is able to identify the owner of the vehicle as its driver the complaint should not issue. Here is another example. Not long ago I represented someone at one of these proceedings charged with annoying and harassing phone calls. The complainant was a former girlfriend who was unable to accept that the defendant was dating another woman. She deliberately made false allegations against the man stating that he had been calling her incessantly, making threats, using inappropriate language and generally harassing her. She stated that he had made all calls from his cell phone, a number that was very familiar to her. We presented evidence to the clerk magistrate that after the couple broke up the accused had that number changed after the woman had been calling him and harassing him. No complaint issued. In previous posts I have mentioned that the standard for issuing complaints at these hearings is probable cause. That standard is the lowest we have. In essence, if someone states that someone else did something illegal to him probable cause has been established. However, the clerk magistrate is not obligated to issue a complaint just because that standard has been met. Rather, a resolution can be crafted short of sending the matter to the criminal courtroom. A common result is to continue the matter for a period of weeks or months at which time, if the accused remains free of criminal legal problems the case will get dismissed. Other times rather than issue a complaint the clerk magistrate will allow the parties time to work out a resolution, report back at a later date and then not issue the complaint. No matter what the charges you should have a lawyer with you at one of these proceedings. 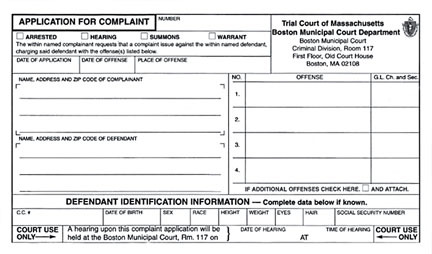 If a criminal complaint issues you will have to answer in a criminal courtroom and get arraigned. At that time, you are officially in the system. Hiring a lawyer might have avoided this altogether. Also, hiring a lawyer for the resulting criminal case is usually more expensive than hiring one for the clerk’s hearing. If you are in trouble call us at 617-263-6800. We will be able to help you.